It has been less than a month since news broke via online social media, that the Tennessee based, multi metal genre-mashing monstrosity DISARRAY were active again. 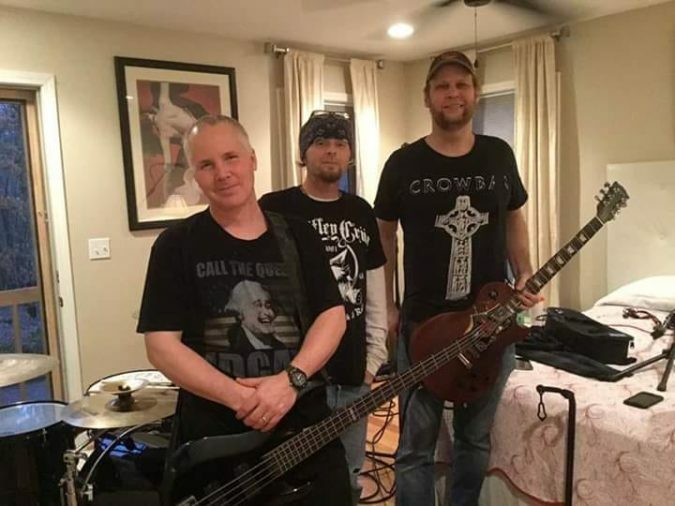 By means of a photo and words, the trio of the band’s last active line up from almost 15 years ago – band founder, guitarist, and vocalist Chuck Bonnet III, bassist Vance Wright, and drummer Shane Harmon – informed the world they were up to something. That “something” was basically a rehearsal, their first since 2005, and some of us are now on pins and needles as we await further word on just what is going on. It was 1993, when Nashville’s DISARRAY stormed the metal underground with their style of heavy, aggro-groove thrash metal. By 1997, varying incarnations of the band had issued three immensely well received demos: ‘Widespread Human Disaster‘ (1995), ‘Bleed‘ (1996), and ‘Spreading The Death Plague‘. With Bonnet and Harmon as the constant core of the band, several players came and went during this period, including guitarist Jim Johnson and bassists Jerry Lomax, Butch Cook, Joe “Hooch” Dotson, and Chris Looney. Bursting with dense, downtuned guitars, shuddering rhythms, pulverizing drums, and gravelly, malicious vocals, these early offerings garnered a lot of interest in DISARRAY. Eventually, Eclipse Records signed the band and released their first official, full-length album ‘A Lesson In Respect‘ in 1999. However, there was one noticeable absence in the band, drummer Shane Harmon, now with Tony Moseley in his stead alongside Bonnet and Dotson. This official studio introduction to DISARRAY inflamed the inferno of interest that was circling the band at the time, helping them secure support slots on popular shows hitting Nashville and the western Tennessee region. Their manic, over-the-top live displays were also fueling a raging word of mouth about the band. Eventually, it all helped lead to none other than Dave Brockie (aka Oderus Urungus of GWAR) getting involved with DISARRAY. The band underwent another membership change in the early 2000’s, as bassist Vance Wright and drummer David Peridore would join Bonnet on a sophomore album, again for Eclipse Records. In 2002, the arrival of the Dave Brockie-produced ‘In The Face Of The Enemy‘ was another outing that metal fans would fast embrace. This was undoubtedly helped in part by DISARRAY being the opening act on the GWAR “Blood Drive Tour” that same year. The band’s stock continued to grow as they landed on several tours with acts like Clutch, Biohazard, Mushroomhead, and Hatebreed, as well as slots on some large-scale festivals. At this time, another established musician, Gary Meskil (Pro-Pain / Crumbsuckers), came into the picture, while drummer Shane Harmon returned. Meskil would produce the next salvo from DISARRAY, 2003’s ferocious ‘Edge Of My Demise‘, but problems were beginning to loom. The band had sought a new label home, yet failed to get a proper distribution release for the album until 2009. By that time, both Harmon and Wright had quit music, so there was no tour to promote the album and interest in the band was fizzling. Bonnet was focusing on a Nashville songwriting career and eventually he and Harmon would team together again in the southern rock band Charlie Bonnet III & The Folkin’ Gasholes (catch them live at Rocklahoma this year).